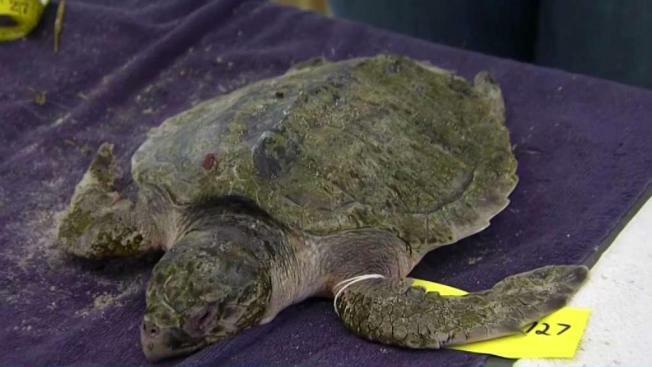 Turtles Wash Up on Cape Cod Shore: Is Climate Change to Blame? The turtles were recovered from Brewster, Eastham and Orleans following a cold snap over Thanksgiving. Of the ones that washed ashore during that time, only a few survived. Nearly 300 sea turtles were found dead along the beaches of Cape Cod after a couple days of freezing temperatures and strong winds. “The turtles froze on the flats more or less, so we got a lot of dead turtles on Thanksgiving Day. Probably about four or five came in alive,” said Maureen Duffy, the turtle research coordinator at the Massachusetts Audubon Society’s Wellfleet Bay Wildlife Sanctuary. For years, the sanctuary has been monitoring the rising number of turtles that strand along the Cape in the fall and winter. In the early 1990s, Duffy said they would rescue a few dozen turtles. However, due in part to climate change, she believes the problem has significantly worsened. As a result, on average, 400 turtles wash ashore every year during the fall and winter. The majority of them are the Kemp’s ridley sea turtles, which are the most endangered. When they try to leave the region to head south they become confused by the Cape’s hook-like shape and often swim in the wrong direction. Volunteers typically walk the shores to retrieve and relocate them to the sanctuary, however, few are accustomed to seeing them freeze so early in the season. “There are a lot of turtles that ended up not making it. I want to help,” said volunteer Megan Cole, who drove boxes in from western Massachusetts to help the staff transport the turtles. After they are rescued, the turtles are shipped to the New England Aquarium’s sea turtle hospital in Quincy for rehabilitation. From there, many are then moved to other locations around the country. While Duffy believes improved conservation efforts have allowed sea turtles to grow in numbers, she contends lack of attention to the warming water temperatures will only lead to more issues in the future. “This is a long-term problem that they have,” she said.